CICRCL and ROZRADA, a Ukrainian Non-Governmental Organization (NGO) have both a legal and an official partnership agreement between them that began in 1994. 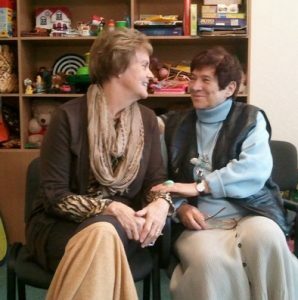 Dr. Janae Weinhold and Dr. Valentina Bondarovskaya began their collaboration in the early 1990’s, and continue to cooperate on projects of mutual interest. ROZRADA’s professional psychologists-consultants work with families, couples, women, men, and children; and they serve as consultants to developing organizations regarding team formation and management, in the area of sociology, and to doctors and educators. Psychologists who work at the Center are members of the international psychological associations, Ukrainian Association of Professional Psychologists and Kyiv Association of Practical Psychologists and Psychotherapists. Six professionals from ROZRADA’s team were awarded with a Gratitude of Kyiv City Administration for the active and professional psychological work. As part of developing their professional skills and learning new methods and psychological technologies, ROZRADA’s professionals also participate in Ukrainian and international conferences. 28 Years of Collaboration and Cooperation! During our years of cooperation and collaboration, Janae has made many trips to Kiev. Between 1990 and 1995, she was there about six times. We were part of a fact-finding group from Colorado Springs that went to Kiev the summer of 1991. Our group, hosted by the Ukrainian government, visited many of the clinics where people were receiving treatment for their exposure to Chernobyl radiation. 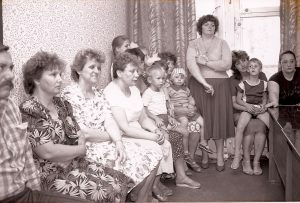 Dr. Bondarovskaya arranged for us to meet with families who had been evacuated from the Pripyat, the village where the reactor exploded. These families had been relocated in large apartment buildings at the edge of Kiev, and ignored by the government. We sat with the group pictured to the right for several hours (with an interpreter) to debrief this tragic turn of events in their lives. It was a heart-breaking experience. Many of the families, particularly the children, were experiencing health issues–physical and psychological. Our group returned to the USA and created an humanitarian project to provide medical, social, and psychological support. We reached out for additional help to an Indiana colleague and psychotherapist, Dr. Patricia Cox, who is also a Registered Nurse. Dr. Cox answered the call by creating the Ukrainian-American Family Network, her own collaborative project with ROZRADA. 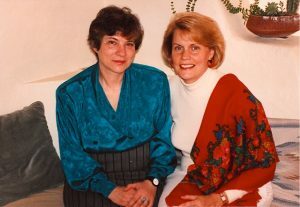 For 25 years, Patricia connected Ukrainian families with American families, and organized ongoing exchanges between them. 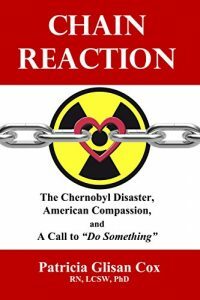 Patricia writes about her experiences inside this Network, which helped many of these families survive the Disaster, in her recently published book. Between 2007 and 2014, ROZRADA organized a half-dozen trainings for Janae that focused on our Developmental Model. During these many trips, Janae stayed with Valentina and her mother, great cross-cultural experiences that life-changing. After Ukraine’s 2014 EuroMaidan Revolution, Janae was familiar enough with the city of Kiev and the Ukrainian culture that she began living independently in her own small flats. It has been an interesting personal process of living through the four developmental stages as she has become increasingly independent and interdependent. Janae has come to understand that she is an American by birth, but has an Ukrainian soul. Here are some photos taken during our many years of collaboration.